I’ve been reading science fiction and speculative fiction stories since I was a kid. But I’ve tended to have a soft spot in my heart for the stories of the past… set in the distant future. Authors have a lot of freedom when they’re writing about a distant world we’re never likely to visit in our lifetimes… even when that world is earth after a major technological advancement. The best stories often just take one simple idea and try to run with its implications. What if we lived in a world with robot servants? What if we discovered we could teleport across short distances? But every now and then contemporary science fiction authors take a much more plausible idea and run with that instead. When I first read Neuromancer I was blown away by the complete world William Gibson imagined where cyberspace was real. But he wasn’t predicting a far-flung future. He was looking at the existing technology of networked computers in 1984 and imagining one way that technology might evolve — and what some of the implications could be for society. And so a million cyberpunk novels were born, and I went back to reading classic science fiction stories. 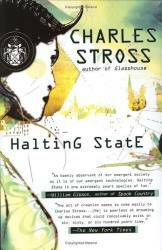 But this week I read Halting State, a 2007 novel by Charles Stross that does for augmented reality what Neuromancer did for the idea of cyberspace. And for the first time I was really impressed with the implications (both good and bad) of this technology which is available today, but which is still in its infancy. As a technology blogger and reporter I’ve been covering augmented reality apps for computers and smartphones for a few years. But I’ve never been particularly impressed. Sure, apps such as Layar, which allow you to point your phone’s camera down the street and see information about nearby restaurants or tourist attractions pop up over the top of the picture are fun to play with for a few minutes. But right now you have to hold your phone in front of your face and look at it instead of the road ahead of you to get the most out of these apps. Just make sure not to walk into that pole that would be in your peripheral vision if you weren’t relying on your phone’s narrow-angle lens. With today’s technology, there’s almost always an easier way to sift through data than using augmented reality. There are hundreds of apps that will show me a map or list with those same restaurants or tourist attractions — and those apps help me make decisions much more quickly and efficiently. But Halting State imagines that by 2018 your smartphone will stay in your pocket and link up to a special pair of glasses that will give you a heads-up display with all the data you could ever need. Walk into a gaming convention and instead of enthusiasts wearing costumes, you can flip a button and orcs and dragons will enter you field of vision. Police officers can use a different augmented layer reality to pull up information they need while on patrol. And of course nobody with one of these setups need ever get lost, since you can see the directions floating right in front of your face. Halting State isn’t just about augmented reality. It also projects the future of video gaming and live action role playing games, distributed computing systems, and a few other trends that might or might not take off. But the world of Halting State feels very plausible based on today’s technology and shows why people are so excited about making apps like Layar, even if they don’t seem very useful today. In the future they might be. Of course, as 2018 approaches, this book could end up looking a lot like a 1950s story that imagines human beings colonizing the moon and fighting Martians. Things don’t always turn out the way you think they will in the future. But I enjoyed Halting State and I’m looking forward to reading Rule 34, the second book in the series. It was published in 2011, and I’m wondering if Stross has made any changes to his world of the future to keep in line with the changes in technology over the past few years. You also have to love any author that apparently titles his book after an xkcd comic.